Some good reference to get you in the mood! There’s already a good review in your Here Now for Revell’s first release of this kit under the USS Wasp flag back in February 2010. Mathew did a good job with that, so my plan isn’t to repeat it all again here; more to fill in any gaps and highlight the changes and new items offered this time around. So, what follows is a re-work of Mathew’s review, plus additional text from me. Here goes, this is a big-un! The plan is that Les V will tackle this great project, which will be something special to see for sure. So keep ‘em peeled for that build coming into SMN later in the year. Just to emphasis the quality we’re dealing with, here’s a few shots of the completed model. Click on the Thumbnails below to enlarge the images and enjoy! USS Iwo Jima (LHD 7) is a U.S. Navy multipurpose amphibious assault ship. She was built by the Ingalls Shipbuilding division of Litton in Pascagoula, Mississippi. 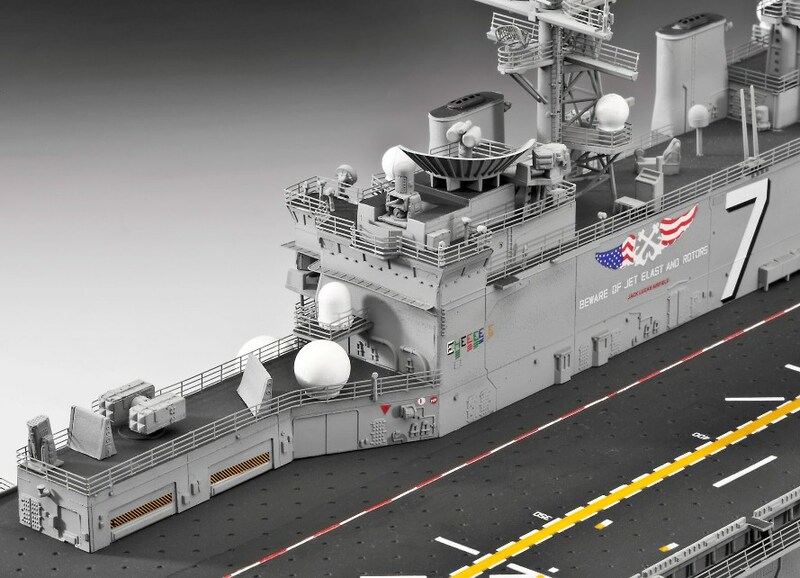 The Navy-Marine Corps team’s newest amphibious warship has, as its primary mission, the support of a Marine Landing Force. USS Iwo Jima and her sister ships are the first specifically designed to accommodate new Landing Craft, Air Cushion (LCAC) for fast troop movement over the beach and Harrier II (AV-8B) Vertical/Short Take-Off and Landing (V/STOL) jets, which provide close air support for the assault force. Iwo Jima, which is 257 m long with a beam of 32 m, also accommodates the full range of Navy and Marine Corps helicopters, conventional landing craft, and amphibious vehicles. Both the USS Iwo Jima and the Wasp are absolutely huge, something Revell does very well; just a little bit smaller than the 1:72nd Gato Class Submarine. When you open the box there really isn’t any space left in it, everything is well packed and protected, even down to the P.E. frets being individually shrink wrapped in their own plastic bag. As Mathew said at the time, so much is in the package, that when he got the kit home and decided to look at every sprue in the box (come on, we all do it!) it took him a good twenty minutes to re-pack all the parts so the box lid would shut. Onto the rest of the kit…. The ship comes with a one piece full hull, which nearly takes up half of the box and is a very impressive (large) piece of plastic. This obviously leads to the fact the kit doesn’t have a waterline option, although somebody who’s either VERY brave or stupid could cut the bottom of the hull. There is also a very well detailed ‘wet’ hangar for the landing and hovercraft and aircraft hangar. This is well set up for someone to add lighting which could show off the interior to its best potential (That’s not me though!!). The second largest piece in the kit is the main deck which runs nearly the whole 73cm’s of the kit. Again this is well cast with raised and recessed detail where applicable, the only blemishes on this kit are in the places nobody will see when it’s built. The rest of the ship is covered on 10 sprues, ranging from the superstructure to the secondary armaments and all the fixtures and fittings in-between. Like the rest of the kit, these are all well cast, with no sink marks or flash anywhere (believe me I’ve looked really hard). One excellent idea that Revell had when designing the kit was to enable the modeller to position the hangar door and lift anyway he/she wants. One thing that doesn’t fit with the overall standard of the kit is the base; to me it seems a little plain, however I’m sure that most modellers will end up re-basing the ship to their own taste. Revell really have outdone themselves this time! You get two sprues covering the vehicles used on a flight deck, towing tractors, cranes, even trolleys with what looks like oxy or nitrogen bottles. There are also four sprues of tanks/APC’s (two sets) which cover AAV7, M1A1, M60A3, MTVR, LAV-25, M1114, M1097 and M198, which is an artillery piece. These are all well detailed, multi-part and, dare I say it, little kits in themselves. Each vehicle has both raised detail and recessed panel lines and all bar the smallest have separate tracks/wheels. My only concern is the paint schemes, especially for the M60A3’s which have a very intricate pattern. When you consider the scale, each tank is about the size of a 5p. The final two vehicle types are 2 LCU’s and 2 LCAC’s; these two craft are well thought out and will build into impressive craft in their own right. Revell provide a very impressive amount of aircraft to grace the deck and hangar area; 2 Sea Hawks, 3 Sea Knights, 2 Cobra, 4 CH-53, 4 Osprey and 2 Harriers. All moulded in clear plastic, which will enable those interested to mask off the windows and, whilst this could be quite tricky, I think it will be a rewarding process. 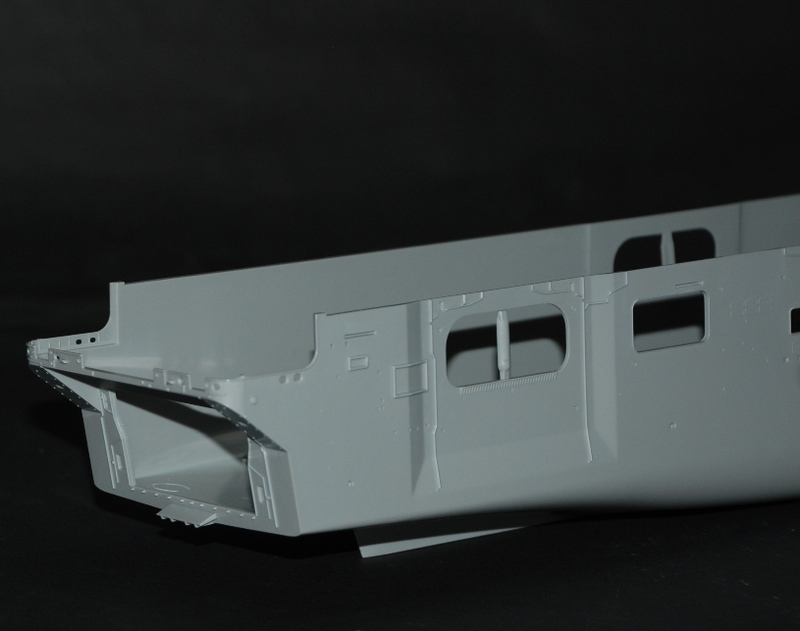 Each aircraft is a multi-part kit (like the armour mentioned above) and have recessed panel lines. The helicopters (with the exception of the Cobras) have the option of folded rotors (which would look great on one of the lifts or in the hangar), as does the Osprey. The Harrier even has a separate canopy and, as you can see from the pictures, these will build into very good representations of the aircraft. All of the clear aircraft sprues come bagged according to type, whilst some of the larger aircraft come on two separate sprues; these are all contained in their own box, a nice touch I think.